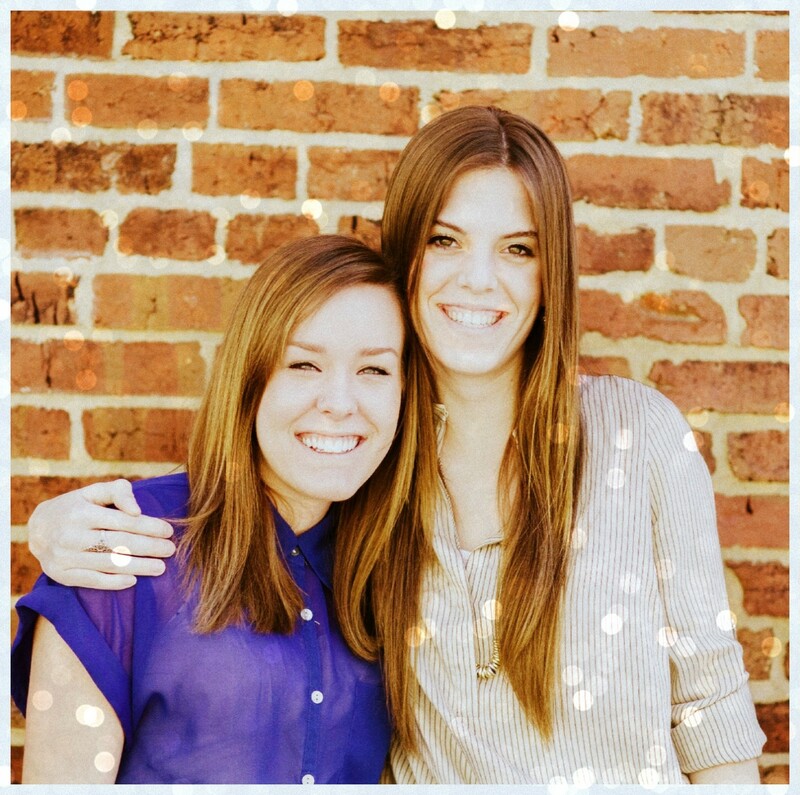 A blog that features local Washington D.C. art in all forms. While on your everyday commute, you pass by that colorful mural in your local metro station twice a day — do you ever wonder what it means? Which artist painted it? 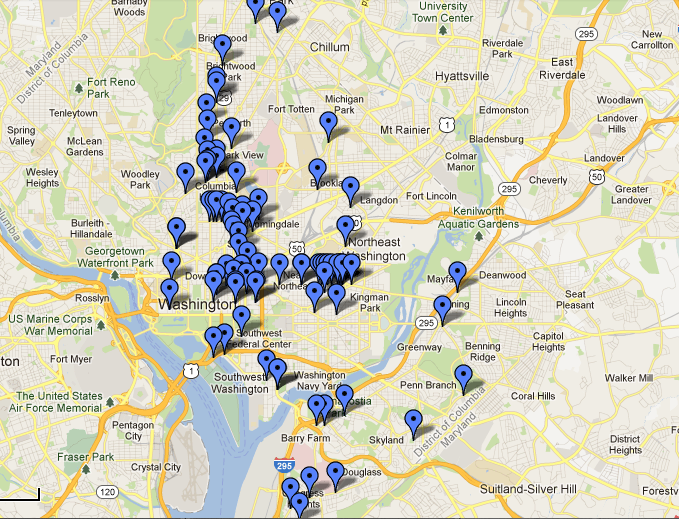 If there are any more like it in the District, and where? Well, lucky for you, District art lovers combined their local art findings onto one convenient map, creating a simple way to plan a weekend trip to explore the city and quench your thirst for D.C. art culture. The map features locations, descriptions and titles of public art pieces, delving deeper into the District’s rich artistic history. Check out the mural details and the interactive map here. Are you looking for an outlet for your intrinsic artistic yearnings? Contact Open Walls, an initiative that allows District residents to leave their mark on the city by painting a mural on a public wall space (legally, of course). Open Walls is sponsored by Albus Cavus, an international artist organization that improves public spaces while promoting neighborhood engagement through art. An article on the Elevation D.C. website recently observed that one of these murals commissioned by Open Walls in 2009, located along the Red Line’s tracks at the Rhode Island metro stop, has been crowded by illegal graffiti. But the mural represents a legal, beneficial and artistic contribution to the area, changing typical assumptions about street artwork. “… it stands in loud defiance of both the surrounding gray cityscape and stereotypes about graffiti,” wrote Elevation D.C.
Current Open Wall spaces in the District include Garfield Park, Edgewood, Sherman Wall, Perry Center, Ivy City and the Raritan River Art Walk, according to the project’s website. To participate, follow the steps listed here. Paint the city. *Video courtesy of Liane Kay. It tells the story behind the mural on the 700 foot wall on Rhode Island Avenue, Washington, D.C.
Last Saturday, my peers and I ventured out to Brookland, a Washington, D.C. neighborhood known for its Catholic landmarks including the Basilica of the National Shrine of Immaculate Conception, Catholic University and the Franciscan Monastery. Along the way, we couldn’t help but noticing a colorful, intriguing mural. Painted on the side of the Brookland Café building at 3740 12th Street N.E., the mural, titled “A Survivor’s Journey,” depicted an image of a controlling man with his hands on his hips, standing behind a blue-hued woman. She was covering her ears while her son looked up at her, seemingly trying to console her. 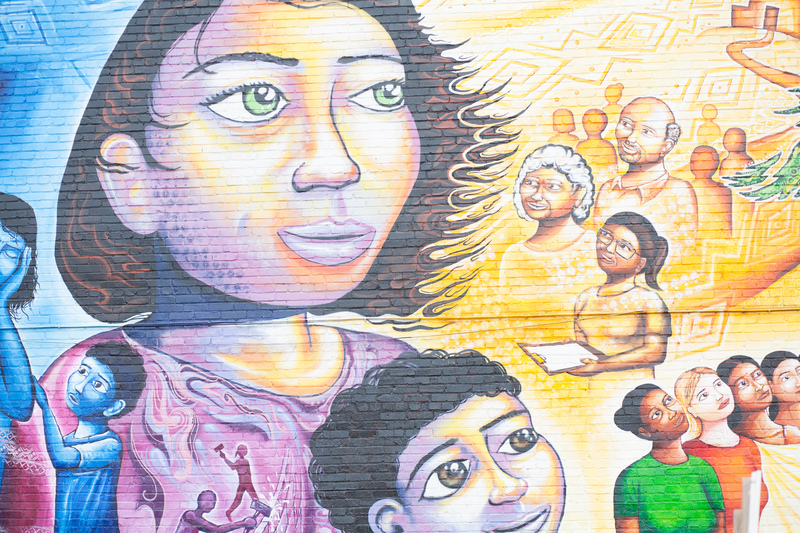 The focus of the mural, though, is the bright green-eyed woman, gazing into the distance with hope for the future. 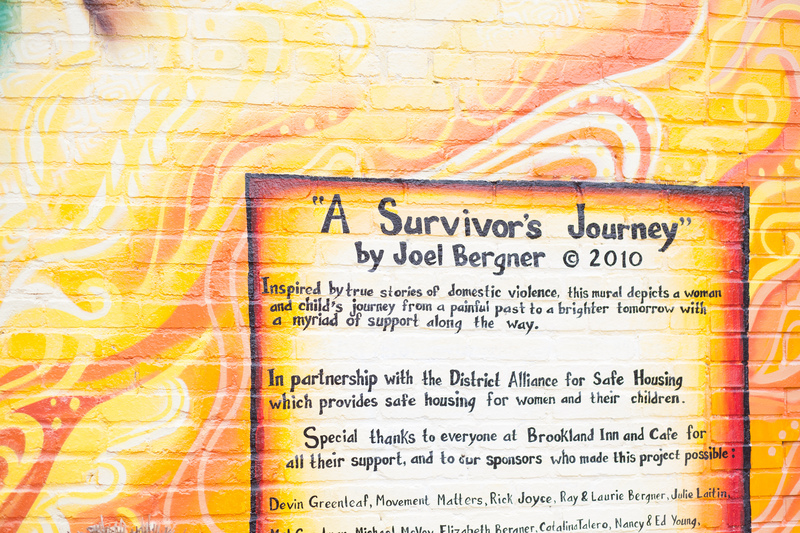 Well-known D.C. mural artist Joel Bergner partnered with the District Alliance for Safe Housing (DASH) an organization that provides services to victims of domestic abuse, to create the mural in 2010. The piece was made to honor the women who survived domestic violence. According to Bergner, he interviewed various DASH employees and clients to infused each person’s story into the mural. The mural’s focus is the hopeful future of the woman and her child who are supported by women of all races and ethnicities. “They now look toward a brighter future with the support of family, friends, and a case worker and are joined by women of many backgrounds, showing that this issue is universal across race, ethnicity and nationality,” Bergner wrote on his blog.